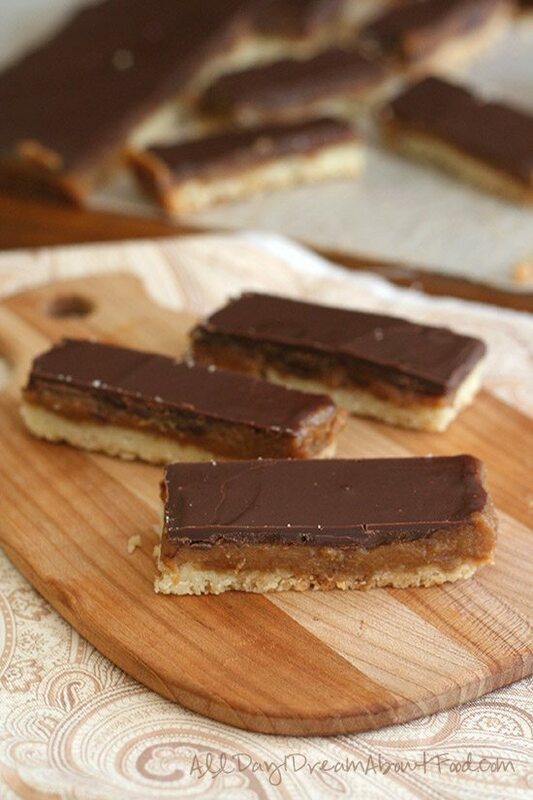 Twix bars get a low carb, gluten-free makeover. 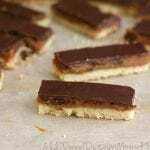 A tender almond flour shortbread base with rich caramel and creamy milk chocolate. Disclosure: I did not receive any monetary compensation for this post, just a few bars of Lily’s chocolate with which to develop recipes. For the crust, preheat oven to 325F and line a 9x9 inch pan with parchment paper, allowing some overhang for easy removal. In a food processor, combine almond flour, butter pieces, sweetener, xanthan gum and salt. Pulse until mixture resembles fine crumbs. Press mixture firmly into the bottom of prepared baking pan and bake 15 minutes, until just light golden brown. Remove and let cool. For the caramel, in a medium saucepan over medium heat, combine butter, Swerve, and coconut sugar. Bring to a boil and cook 3 to 5 minutes (be careful not to burn it). Remove from heat and add cream and vanilla. Mixture will bubble vigorously. Sprinkle with xanthan gum and whisk vigorously to combine. Whisk in salt. Let caramel cool about 20 minutes, until thickened but still pourable. Pour over crust and let set in refrigerator 10 to 15 minutes. For the chocolate topping, set a heatproof bowl over a pan of barely simmering water. Do not allow bottom of bowl to touch water. Add chopped milk chocolate and stir until melted. Pour chocolate over caramel and spread to edges with a knife or offset spatula. Let chocolate set before cutting into squares or bars. Serves 18. Each serving has 5.62 g of carbs and 2.72 g of fiber. Total NET CARBS = 2.9 g.
I gave up on making white chocolate as well. I have also some difficulty with unsweetened chocolate. I now just buy the high % and go along with that 😀 Great looking bars! Chocoperfection makes good milk chocolate too, but it is usually easier for me to find Lily’s locally. We don’t even have a Whole Food’s or Wegman’s where I live. I usually get my low carb cooking supplies at our local natural food markets. Walmart has a gluten free section in many stores now, but mostly it is premade foods and baking mixes. Anyway, I like dark and milk chocolate, never was a fan of white chocolate. You should definitely try Lily’s then. I think it comes to 7 g net carbs per serving? These look DELISH! And I have all the ingredients on hand … Except the chocolate. Next time I’m near a Wegman’s I’m going to have to find some. Can’t wait to try the recipe! Twix are my favourite. My current favorite is Lily’s salted almond. Just ordered a bunch! These look so good Carolyn – can’t believe they’re low-carb! Twix are my favorite and I do miss them since giving up sugar. This looks fabulous! Thank you so much! Amazing!!! I do love my dark chocolate but this looks amazing! Hershey’s has sf milk chocolate chips that taste like their regular chocolate! Found mine at Walmart and meijer has them too. Since I started eating dark chocolate (72%), I find milk chocolate way too sweet. As delicious as you make milk chocolate sound, I’m a die-hard dark chocolate fan. But would love to win these to try them! No matter how hard I try, I just can’t seem to like dark chocolate as much as milk chocolate! Milk chocolate is my favorite! If I’m eating it plain, I love a good 70-75% dark. I keep trying to like the higher % plain, but I can only enjoy that intensity in cookies, etc. My absolute favorite is dark chocolate covered caramels with sea salt. Oy. Not ideal for blood sugar! btw this recipe looks AWESOME! These look amazing! Love Lily’s chocolates. On my ‘to make’ list! My favorite kind of chocolate is….ALL of it! lol Except the sugar-free kind with sugar alcohols (other than erythritol), because my digestive system can’t tolerate them. I’m not sure if I can tolerate the inulin, either, but I’d like to try it to find out. Ugh, sorry about that. I don’t eat any other sugar-free chocolate, unless it’s the stuff I make myself! My son’s favorite candy bar is Twix; this would be perfect for him! I like bittersweet chocolate. I feel like it’s the best of both worlds – creamy mouth feel of milk chocolate, but the heavy chocolate flavor of dark chocolate. I use to love milk chocolate but now have gone over the dark side. The darker the better. I love 75-85% cacao (and I’ve even been known to nibble on unsweetened baking chocolate). I’m in LOVE with Lily’s Chocolate!! I love it all, but I prefer milk chocolate. I have tried Lilly’s dark chocolates, but not the milks yet! I also like Coco Polo’s and splurge on a bag of milk baking chips from time to time, but I was excited when Lilly’s popped up in local health food stores. First, my vote is for very dark chocolate. [Actually the ONLY milk chocolate that I have found alluring is Coco Polo’s version, which is dangerously good.] Second, I prefer Coco Polo chocolate but switch to Lily’s when the higher cocoa content of the former might interfere with my sleep. IMHO, 54 percent does not = dark chocolate. I will say that as far as mouth feel goes, Lily’s is the winner. I REALLY wish Lily’s would come out with a bar that contains a higher percentage of cocoa! I have found that chocolate with inclusions just spurs me to eat a lot of it. Also, a higher percentage of cocoa is more satisfying than a lower percentage, and thus I (chocoholic) am content with much less of it. These look delish….can’t wait to try em! White chocolate is my fav! I LOVE white chocolate, which I know isn’t really chocolate! But.. some very good milk chocolate will do in a pinch! I’m falling more in love with dark chocolate every day, and when it’s salted, I swoon! Milk chocolate is my favorite. It looks so good. I am going to try to find Lily’s Chocolate at Wegman’s!! I love dark chocolate, the darker the better!! I love every kind of chocolate. I would love to try Lily’s. Love your site! I don’t discriminate against any kind of chocolate 🙂 But, if I had to choose, probably milk chocolate – it’s so decadent! I love all chocolate! I do prefer milk chocolate but love me some white and dark too. I really like Dove dark chocolate in the red bag/wrapper. So creamy! I love all chocolate, but if I have to pick, dark is my favorite! All chocolate is the death of me, but if I had to chose my way to die, it would be in a vat of milk chocolate! I love all chocolate! I’ve not used any of these sugar free chocolates before and I would love the chance to try them. 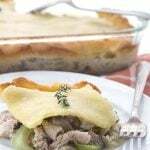 Thank you for sharing all of your wonderful recipes! Dark chocolate…hands down. And I love me some Lily’s…. I love dark chocolate. I go to trader Joes and get the sugar free one. I’ve never had Lilys though. My problem with the TJ’s sugar free bars is that they contain maltitol, which spikes my glucose as much as regular sugar does. Maltitol hurts my stomach as if I were poisoned! Yuck! Hate that stuff! Xylitol actually hurts my tummy too, but not as much. Erythritol seems to be fine, thank goodness! Thanks for this recipe! Do you think gluccomannan would work in place of xantham gum? I haven’t worked with it so I am not sure how it thickens things but it’s worth a try. How about using gelatin in stead xantham gum? That might gel it but it won’t make it a nice caramel sauce. But you can try! Dark chocolate is my favorite! Milk choc is my favorite for sure, but I have come to appreciate the dark. White?? Blech. Oh my word – this looks delicious! I need to find some Lily’s chocolate…and fast! Dark chocolate always for me! Since I’ve gone low carb, I’ve fallen in love with dark chocolate, though 72% is about as high as I can go. I prefer dark chocolate but don’t mind milk chocolate once in a while. I like both dark and milk chocolate and really love Lily’s brand! Pick me! Thank you for the recipe. This looks delicious! I can’t wait to try it! Yum! These look really good. Thank you for sharing! Where do you get coconut sugar? It’s in a lot of natural aisles in many grocery stores. Whole Foods has lots of it and Trader Joe’s carries it as well. our walmart carries it, although i got mine online from swanson’s. You car use white or brown sugar instead. And before everyone attacks me saying coconut sugar is ‘healthier’, they should do their research an NO, I don’t mean Google and Dr. Oz! Coconut sugar has the same calories as white sugar. The rumours flying about the low GI (35 vs. 60 for white sugar) are based on one terrible quality paper produced 14 years ago by government sanctioned research in…. you guessed it! The Philippines, the world’s top coconut sugar exporter. The testing was redone at the University of Sydney and published in 2014 as a GI of 54. Not exactly earth shattering compared to white sugar at 60.
yeah not sure how cocunut sugar is considered low carb. Not sure how it can be in a recipe labeled low carb. Kinda misleading. hopefully people will do resaerch before using. Hey Lisa, do the math please! The amount of coconut sugar adds almost NOTHING to the carb count. Hence, still low carb. i would be happy to try these!!! The darker the better for me! My favorite is Green and Black’s 85%. So smooth. I can’t wait to try Lily’s! Oh, my! Oh, my! Oh, my! Dark chocolate, milk chocolate, white chocolate, it doesn’t matter. I love it all! What a great-looking recipe! If I’m just eating a bit of chocolate, I prefer dark (because I’m satisfied with less and I think it’s healthy); but, for baking, I prefer milk chocolate (and that’s what my family likes, too) I love Twix bars! Thanks for sharing the recipe. I love dark chocolate. This recipe looks amazing!! in America I only like dark chocolate usually! Favorite Chocolate: Dark with coconut! I’d use dark chocolate on this recipe. I like using Lily’s chips when I don’t feel like making my own…but the price is just too high for us to use them regularly. Thanks for this recipe, and the chance to win LIlly’s chocolates!! Like you, my favorite chocolate is dark! But Twix was an old standby. Oops,,,, I need an edit button…. *Lily’s. There is nothing better than dark chocolate! I have always loved any kind of Lindt chocolate. Milk is my fave! I like Lilly’s Chocolate chips, but have never tried the other varieties. depends on my mood. I like dark, very dark, milk, even white…white the least though. ( I know whites not chocolate) Either way, I never turn any of them away if offered. Unless I’m sick, very sick. I used to prefer milk chocolate, but since going low carb (and giving up sugar, etc.) my palate has become more sensitive to the taste of sweet – so I now prefer dark chocolate! I also like dark, and tend to not eat milk chocolate due to the sugar and difficulty in making my own. I’ve also had similar problems working with white chocolate. It used to be milk chocolate, but I’ve come to appreciate dark chocolate more. Chocolate Brownie Donuts – Low Carb and Gluten-Free (we made them as bars). They are wonderful. Thank you for the recipe. We’ll be making them again soon. I used to really like dark but since going low carb I really miss milk chocolate now. Would LOVE to win!! I love milk chocolate, but haven’t had any in forever. I have never tried Lilly’s chocolate but would love too. I’m a dark chocolate fan myself but my husband loves milk chocolate. I love Lily’s! The best sugar-free chocolate I’ve hag… and among the best chocolate I’ve had! …and my favorite kind of Lily’s chocolate is the Milk with Salted Almond! I’ve never liked milk chocolate, even though a couple of my favorite candy bars had it – $100,000 bars and Twix. I could sometimes find the dark chocolate version of Reese’s Peanut Butter Cups, which I much preferred. 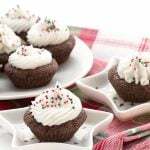 These look great, but I will probably make them with dark chocolate instead of milk. BTW, I love Lily’s Chocolate Chips! They save me a lot of extra time chopping chocolate. I get mine from netrition.com. I LOVE LOVE LOVE Dark chocolate! Just recently discovered Lily’s… SOOO Delicious! Twix is my favorite candy bar…Because of my issues with sugar I have not eat one in years!! Im so looking forward to try this recipe! Wow… it’s hard for me to even imagine how to make DARK chocolate. I commend you for trying out the milk chocolate! I prefer dark but the rest of the family like milk chocolate,,, oh well,,,, more for me !! It’s true, life is like a box of chocolates! Sometimes you need the dark, sometimes it’s the milk. Sometimes you need just a hint of spice in them. So what kind of chocolate do I like? A variety! I really like Lily’s. My digestive system despises malitol; so, I was happy to find Lily’s. I live for all chocolate. I have 2 favorite Lily’s – dark chocolate coconut and milk chocolate with salted almonds. I like dipping the milk chocolate in natural peanut butter with sea salt added. For those that don’t know, Whole Foods gives you a 10% case discount when you purchase (I think 12 of any single item). You might want to double-check the minimum. So, I load up when they are on sale as they are relatively pricey. BTW, I can’t wait to try this recipe. I don’t keep coconut sugar in my pantry. Any other suggestions? Also, I only have an 8×8 pan. Will that make a huge difference? Should I rig a 9×13 with heavy duty aluminum foil? Do the 8×8 and cook the base for a few minutes longer. As for coconut sugar, you can do all Swerve and just add a few teaspoons of molasses to get the caramel colour, but it will harden up a bit more after cooling. I used to prefer milk chocolate, but I have found since going low carb many years ago that my taste for sweet has changed drastically. Now I love dark chocolate and anything under 70% seems way too sweet for me. 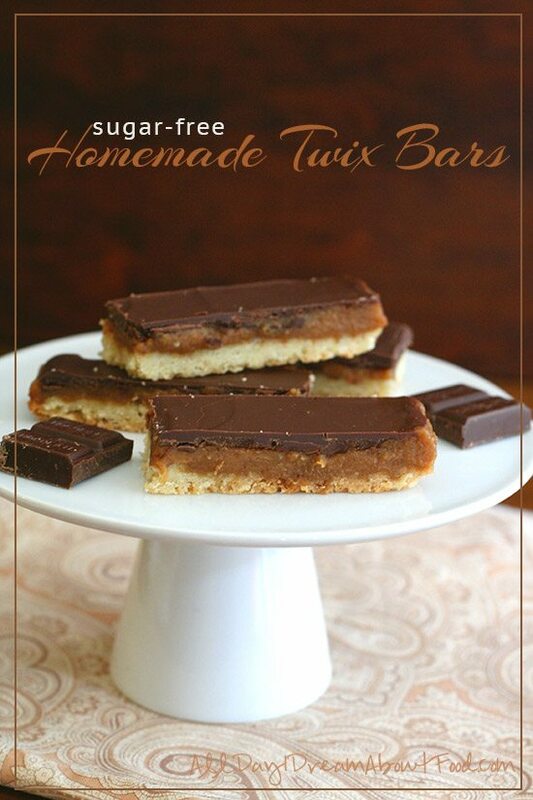 Twix bars used to be a favorite – can’t wait to try these! Since I went to Dark Chocolate, I’ve never been able to go back! Thanks for the giveaway! I prefer dark chocolate now that my tastes have changed since eating less sugar! I really enjoy dark chocolate. I prefer the Lily’s chocolate chips over their bars, not sure why. Any chocolate is wonderful — but dark is usually the type that I buy. I am an equal opportunity chocolate lover-I love them all! I LOVE all chocolate!!! My very favorite chocolate bar is Heath. But that’s an indulgence of the past. I’d love to try Lily’s chocolate!!!! You could sub xylitol, but your final result won’t caramelize as well. If you want a richer colour, add 2 tsp of molasses to the caramel before cooking. Milk. Dark does not taste sweet enough. Would love to try the chocolate…..sounds yummy!!! Forgot to say I like both milk and dark……dark is usually healthier. Lily’s dark chocolate with almonds is my favorite. I was so happy when I discovered their products. Having grown up in a candy making family, my grandfather, dad, uncle and cousins all had candy stores, I appreciate all chocolate but I have to say that dark chocolate has always been my favorite. Can’t wait to try these though! Love chocolate from milk, Nestle’s semi-sweet chocolate morsels, to dark. As I’ve gotten older, I like the darker better. 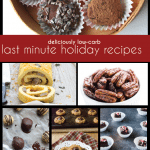 Thank you for all your GREAT chocolate LC recipes that keep me on track! I’ve missed TWIX!, so thank you very much! Any chance of a LC Kit Kat copy cat recipe coming soon? Dark chocolate, really dark, is my favorite, but never met a chocolate I wouldn’t eat. Eager to try Lily’s. Your recommendations are always great. Awesome recipe! I would really like to eat a good quality milk chocolate! I love dark chocolate with a spicy kick to it, or mint, or almonds, or cranberry, or anyway that dark chocolate can be made. I love Lilly’s chocolate! It used to be white, but now it’s dark. Yum! Dark chocolate is my fav!! I have looked for these everywhere and cannot find them! Pick me! Pick me! and my favorite chocolate is dark! I’ve never met a chocolate I DIDN’T like! Do they come out crisp as the Twix bars? Definitely more tender but still delicious. My husband was a huge fan! These look so yum! Love any kind of chocolate. Milk and white chocolate. Caramel just makes milk chocolate all the better! I love chocolate with caramel! Twix bars have always been a favorite. Can’t wait to make these. I love any kind of chocolate!!! Thanks for the recipe. Haven’t had milk chocolate in a long…….would love to try this healthy milk chocolate. I ❤️ your blog! 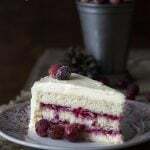 Thank you for so many great recipes that are decadent and feel like a cheat! 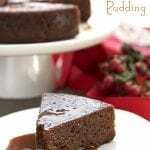 I have made your chocolate pudding from the Dirt Pie recipe twice already- love at first smell and taste. I definitely love dark chocolate! Can’t wait to try Lilys brand! Lily’s bars are the best. Just bought some Lily’s chocolate chip that I can’t wait to try! Lily’s bars are the best. Just bought some Lily’s chocolate chips that I can’t wait to try! I love the cookie part of Twix and can’t wait to try these. There aren’t a lot of recipes that get me motivated to bake in my tiny kitchen, but this one is going to happen! Dark chocolate…I would like to try Lilly’s ! Love it! Can’t wait to try it! These sound soooo good! I love white chocolate like crazy, but Twix was always my favorite candy bar. Since I’ve been eating LC it’s one of the few things I miss desperately. I’ll have to try this! I love milk chocolate and Lily’s is so good! Thank you so much, Nicole. That means a lot from someone who has that much baking experience! There is no such thing as bad chocolate! I love it all! I have found Lily’s chocolate bats at whole Foods, Sprouts, and Natural Grocers here! My favorite so far are the Dark Chocolate Almond bar. I have not tried the milk chocolate or the chocolate chips, yet! Pick me, pick me! I love milk chocolate… Clearly I need to check Lily ‘ s out. Thanks! Just made these and they are great! I ended up using dark chocolate which worked well. My cookie base came out soft unlike a twix but still delicious. They remind me of toffee bars which is a good thing. Why yes, I’ll leave a comment here! 🙂 To be honest, I would have anyway. Twix is my favorite candy bar and oh, how I miss it! I’m excited to try this. I love your blog and I love Lily’s chocolates! I don’t have coconut sugar, can I use Swerve? FYI, I found these Sugar-Free Semi-Sweet Chocolate Chips sweetened with maltitol (not to be confused with malitol). My husband and I are both diabetic and find that maltitol does not have the laxitative effect that malitol does. I’ve never heard of malitol and when I google it, it asks if I meant maltitol. I think they may actually be one and the same thing! Maltitol does affect my blood glucose so I steer clear of it. My faith in your abilities is so boundless that when I saw this recipe I was SO excited because I just KNEW you had mastered low carb milk chocolate in the home kitchen and could hardly wait to get started! Alas, wait I must but I’m still excited to place an order and get started. I have grown to love dark chocolate more than ever but once on awhile I just long for some creamy, milk chocolate too. Thanks for sharing your talents! Dark chocolate is the best, but I’ll eat milk chocolate out of desperation. Fair trade is such an important designation. I’m happy to support this company (especially with such a delicious-sounding recipe!). I prefer milk chocolate, but am trying to learn to like dark chocolate. Less sugar! Dark chocolate! But I have heard such good things about Lily’s I am anxious to try it! Lily’s bars are delish. Just bought the Lilly’s chocolate chips and can’t wait to try them! I think milk chocolate is my favorite, but I’m acquiring a taste for dark as well! Even though I love dark chocolate, milk chocolate (especially with caramel filling) is still my favorite. Dark chocolate, all the way! I like milk chocolate and dark chocolate equally! These look delicious! Dark chocolate is my favorite! We love Lily’s! I sprinkle shavings of it onto Carolyn’s low carb coconut pancakes for my daughter. Delicious! I wish they sold the chocolate chips at our store. Hi, I want to try this, but don’t understand how you get 36 long thin bars out of a 9×9 pan? I cut 9 strips and then cut each of those strips into 4. 80-90% Lindt or Valrhona are so, so good. Milk and dark are both scrummy! 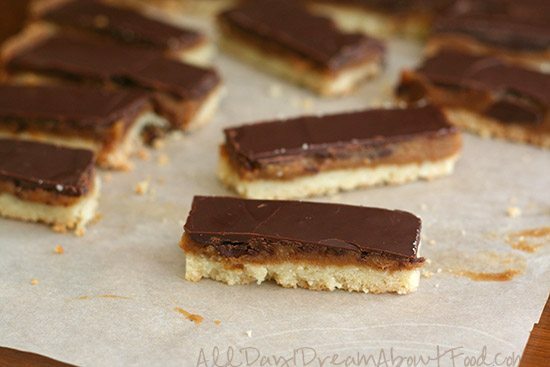 This recipe is going to suit me just fine…hubby likes to have frozen twix on occasion and now i can join him! : ) Thank you for all your efforts! I love Lilys dark chocolate almond and Lilys dark chocolate coconut! It’s the best low carb chocolate! I love ALL chocolate….really want to try Lily’s…. my favorite is any with nuts! 🙂 Thank you!! Mint chocolate is the best! I love milk chocolate the best. 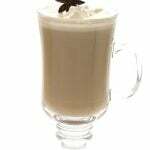 Carolyn, I’ve found a product on Amazon that I’m wondering if it would help make white or milk chocolate. It’s powdered heavy cream. I made a batch last night of the chocolate recipe from your Sea Salt Almond bark, and used 3/4c of cocoa powder and 1/4 c of cream powder. I mixed the cocoa and the cream powder together first, then stirred it into the chocolate and cocoa butter. It worked relatively well, except that it’s soft at room temp, and I’d like to have it a bit firmer. Would something like this work with regular bakers chocolate and cocoa butter? Thanks so much for your help. The goods I make from your recipes go to bake sales that benefit a 501c3 not for profit group that helps folks afford the care for their diabetic cats, instead of having them put down. 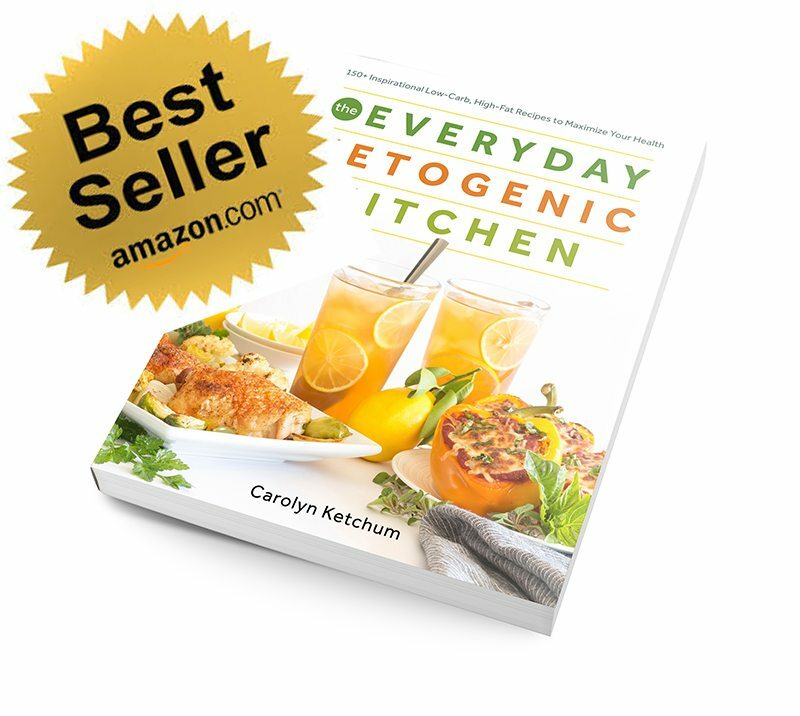 With every sale, I attach a card that gives your site as the origin of the recipes, along with info on Dr Perlmutter’s book Grain Brain. Many folks are willing to learn about this lifestyle! Barb, that’s so wonderful about the bake sales. And thanks so much for giving me the shout out. I’ve seen that powdered cream on Amazon and have been curious to try it for white chocolate, actually. But I wonder if that made the bark soft, because normally it wouldn’t be. I love some really good dark chocolate! 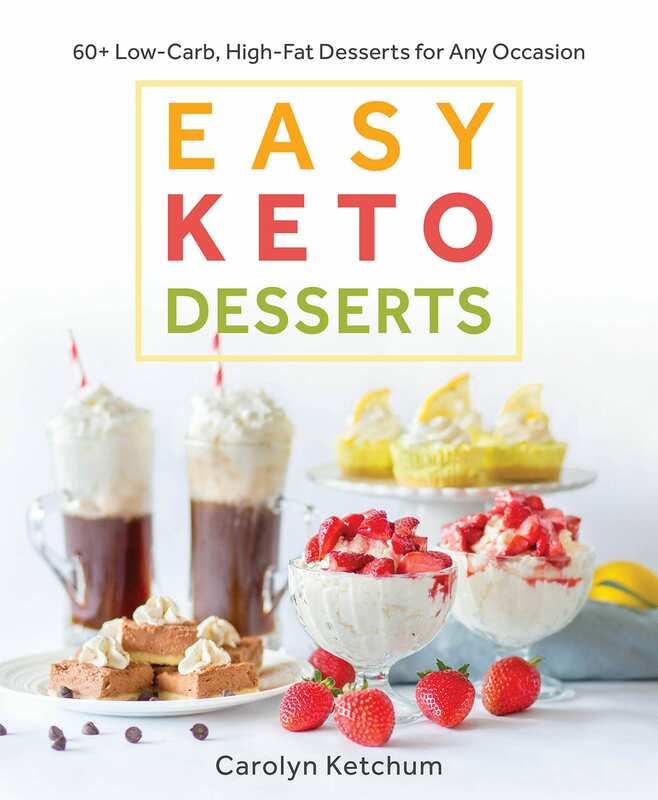 must try…I really want to start baking low carb/sugar free…I wish someone would open a low carb bakery!!! I love all chocolate, but have been trying to retrain my sweet tooth to like dark chocolate. Would love to win! The darker the better for me! There’s a local chocolate place near Boston (where I live) called Taza. They make amazing dark chocolate! I live near Boston too and know Taza well! I love milk chocolate most of all! Our daughter was just told that she needs to start eating gluten-free. Thank you for sharing all your recipes and hints 🙂 BTW, dark chocolate is my favorite! I really have grown to love dark chocolate(65%-70%). I also really love your blog. I have gotten some excellent recipes. The one I just made was the chocolate pound cake but I made muffins so I can portion control. I have to tell u they have really kept me on my low carb track. I just got a bag of Lilly’s chips and use them in my microwave mug cake. So glad you liked the pound cake! These look so yummy, I’m excited to make them! ok what else can I use to sweeten these twix candy ? othere than that sweetener ? You can try other low carb sweeteners but I can’t guarantee how they will turn out. Swerve caramelizes so it’s the best choice for caramel sauce. Love dark chocolate the best, but milk chocolate will do just fine! Milk chocolate is my favorite!!! I love all your treats Carolyn. 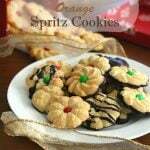 I can’t wait to make these for a party this weekend. Can you let me know how you would recommend storing them? Can they be refrigerated frozen or will that wreck the caramel. Oh my goodness. I agree with you, I definitely prefer dark chocolate but these look pretty crazy good. Can’t wait to make them! I used to be a huge Milk Chocolate fan, but I found over the past few years that I prefer dark chocolate now and that love has grown since going low carb. I love your site! Thanks for sharing all your fabulous creations!!! My favorite chocolate is Hershey’s special dark. Mm. But I’ve had Lilys and it is *good*! I’m assuming regular sugar is a fine swap for the coconut sugar. If I wanted to make this completely sugar free, could I use more Swerve or maybe a little Stevia? 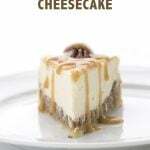 Yes, you can use more Swerve, but your caramel will be lighter and may harden after cooling. Milk chocolate, caramel, and low carb? Sounds wonderful!!! Milk chocolate is my favorite, and the only thing I like as much as chocolate is caramel. Thanks for another great recipe. I made these yesterday. Just wondering about the amount of coconut sugar– 2 tablespoons seemed like a lot (24 carbs worth!) I could do the math, but since I’m lazy I thought I’d just ask– is it supposed to be 2 teaspoons by chance? No, it’s 2 tbsp. Yes, I know it’s carby but it really helps the consistency of the caramel. You can go all erythritol if you like but it may harden more after cooling. Or you can do all erythritol with 2 teaspoons (not TBSP this time!) of molasses to get the right colour, but it will still harden up a bit after cooling. Coconut sugar seems to hold moisture better and keeps the erythritol from recrystallizing. I love all chocolate! But my favorite is dark. Chocolate, I love ALL chocolate!!!! Make up the difference in the sauce with some more erythritol or swerve. Your caramel will harden more after cooling and will likely be lighter in colour but you need a bulk sweetener for it. A friend told me about your site and here I am, looking at the Twix recipe and signing up for your chocolate giveaway. Why wouldn’t I! Thanks. I wish I liked as dark of chocolate as you. But the furthest I can go is about 80%. I’ve tried 85 and 90%, as a matter of fact, I think most of each of those bars are still somewhere in the freezer… They’re just too dark for me. I also have tried making white chocolate and was unsuccessful at getting a creamy, smooth sweet treat out of it. I’ll keep the chunk of cocoa butter in case someone far more creative than myself discovers the secret to creating that piece of perfection. But, I am not particular otherwise. Any, and nearly all, chocolate is darn tootin’ good in my book! I love any kind of chocolate!!! Prefer dark chocolate! But I have to try these bars! They look amazing! I love milk chocolate! I’ve never tried Lily’s chocolates but I do like the Simply Lite no sugar added chocolates that I find at Trader Joes! I am a dark chocolate lover, the darker the better! These bars look delish! I can’t wait to try this recipe! Thanks for the info on Lily’s. I am not a big fan of dark chocolate but use it because milk chocolate has way too many carbs for my low card diet. My favorite kind of chocolate is dark with sea salt. I love all chocolate, mostly mixed with nuts, fruits or caramel. Now that I’m low carb/sugar free, I’ve decided I like milk chocolate more than dark chocolate after a whole lot of years. I’ve recently discovered Lily’s and really enjoy it. So glad to know there’s healthier choices for some of the simple pleasures in life. 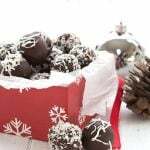 Haven’t had Lily’s chocolate – looking forward to finding some – love your candy recipes! My sensible mind says good quality dark chocolate 60% or more. My craving mind says good old milk chocolate for the creaminess and sweetness. I always have the angel and devil sitting on my shoulder when trying to decide! LOL! Thank you SO much for this recipe and the tips about Lilly’s Sweets! I’m very excited and will be buying some as soon as I finish this. Thank you too for ALL your recipes, I’m a huge fan!! I already found Lily’s Chocolate Chips and they are FANTASTIC!! I would love to try the bars. Your site is Terrific also. Keep up the great work!!! Dark chocolate is my preference and Lily’s is fantastic! Wish they still carried it at my co-op! I’m a lover of dark chocolate! Love dark chocolate and absolutely love using Lily’s chocolate chips….they are great! 60% dark chocolate! even up to 75%! Absolutely love it! Thanks for keeping us on-target and un-deprived!! Definitely the dark, dark chocolate – 86% and on up! These look really good. I see some in my future! I a=have tried making my own low carb chocolate and have run into problem with it seizing when additional ingredients are added. I’d love to try some of Lilly’s! 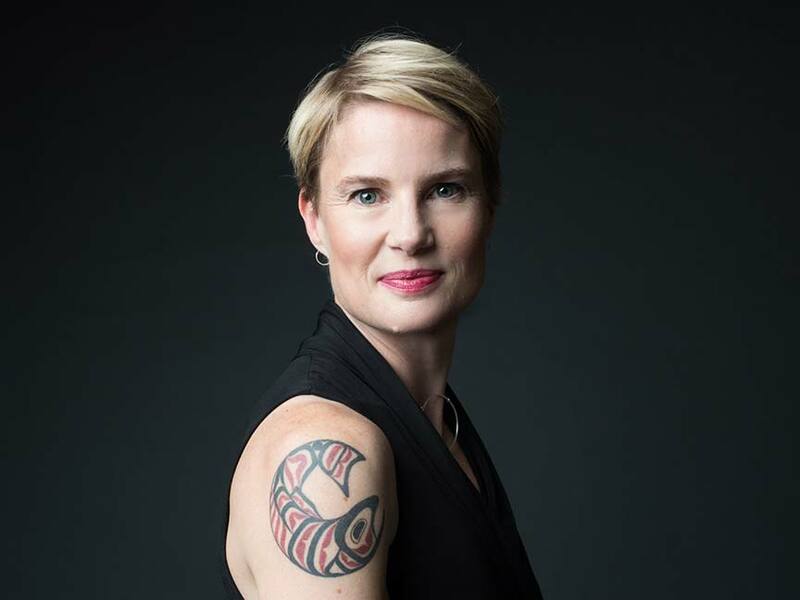 I prefer up 70 – 83%· Tee is a fantastic local chocolate maker… Malley’s that makes my favorite dark… if I were still eating sweet. 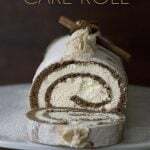 Looking forward to trying this recipe, it is RIGHT up my sweet tooth’s alley. I love dark chocolate best, but chocolate is chocolate! my favorite is dark chocolate. I love it all, but milk chocolate is my ultimate favorite. Dark is my absolute favorite, especially the Lindt dark chocolate truffles!!!! Thanks for the chance to win!! Dark. I once threw Lilly’s chocolate chips into a nut and fruit trail mix that melted in a hot car. I had the most delicious clusters. Now I will do it on purpose. Yum. I will definitely have to check these out next time I go to whole foods!! Love dark and milk chocs equally! I love milk chocolate especially paired with caramel. I am in heaven!!! Bittersweet dark chocolate is my favorite. Dark chocolate all the way. I don’t play favoites, I love chocolate any way, shape, or form it is served in. After reading through the comments, I saw you would recommend replacing the coconut sugar with more granulated Swerve for those who don’t have it on hand, but just that it would harden a bit more. It would still retain some softness, yes? Or would this end up being something like a HARD caramel candy in the middle of the bar? Also, would ZSweet be alright to use instead of Swerve? Thanks so much!! What coconut sugar do you use? These bars are amazing!! Thanks! Just a brand I got from Whole Foods. I can’t remember what it is now, actually. I have a few bags of Bob’s Red Mill to try out now too. Thanks! I love your recipes! Yum! Tears before there were Twix, these were called “Millionaire’s Bars” and you’ll find the “all sugar, all the time” versions in cookbooks under that name! I used to love to make (and eat them) so thanks for the sugar-free version! Hi there. I’ve just made them and the last layer is setting in the fridge. Yum. Just a question though – my caramel didn’t set/thicken :-(. In the end I stuck it in the freezer and that hardened it up, but I’m wondering how it’ll turn out when I go to cut it. Do you know why it didn’t thicken? I did change one thing to the recipe and that was to replace the coconut sugar with the sweetener. Could that be the reason? No, it sounds to me like it didn’t actually cook long enough. But what sweetener did you use? Was it erythritol? Yes I used erythritol. I let it boil about 3 minutes. It’s absolutely delicious!! But I have to keep it in the fridge so that the caramel holds together… I used black chocolate on the top by the way, really yum!! These look great .. Wondering why the xanthm gum? Could it be left out? Also trying to use what I have on hand here. I do not have swerve sweetener but I am wondering if brown rice syrup would work? I really have no idea about the syrup, I don’t use any such thing. Xanthan gum helps keep the erythritol from recrystallizing. Do you think you could add more zanthan gum and make plain caramels? That sauce is so awesome! Thanks! It’s really hard to say…I am not sure erythritol based caramel will ever harden and become as sticky and chewy as sugar-based caramel. Hi I was wondering if there is anything I can substitute for the coconut sugar. I am allergic and would love to make this…Any ideas would be great. Thanks. A few tsp of molasses should work! These are absolutely fabulous! Twix are one of my favourite candy bars and its been so long since I had some. So glad I can eat these without the guilt or having a highly processed sugar laden product. I used surkin gold instead of coconut sugar and Lily’s dark chocolate chips because thats what I had on hand. The caramel took a long time to set (basically overnight) but I was impatient so after about an hour I poured the melted chocolate on top. It came out to marbleize rather than layered. So its very pretty but not the traditional mimic of a Twix bar. Everybody in the house loves these and are unbelievably delicious. I’m fighting the urge more than one serving! I think maybe your caramel took a long time to set because of the sukrin gold swap. But glad it worked out in the end. No doubt in my mind these are AMAZING! These are right up my alley or should I say my kitchen! Can’t wait to try them. I haven’t had a twix bar in many years and now I can! This recipe sounds amazing!! Wish I had one now. Huge yum! These sound fantastic! 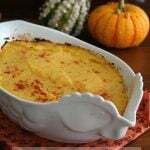 I know this recipe is a couple of years old but it came up on ny Facebook feed recently and I saved it. Loved the shortbread and was wondering for ages how to make caramel! I’m in the UK and recently imported some Bob’s Red Mill Fine Almond flour – oh my gosh the quality! First biscuity thing I’ve made which didn’t taste rancid. Obviously the almond flours we get here are not made with fresh almonds or stored correctly. We used 85% dark chocolate with some cream for the chocolate topping. There is a stevia milk chocolate available here but we prefer dark. Hello Carolyn, I love your recipe’s. 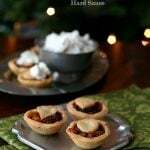 They always work perfectly for me and are a huge favourite with my family. I love the look of this one but I was wondering if I could simply use extra xylitol rather than coconut sugar? I saw someone else subbed in an alternative and it worked but didn’t set as well, do you think I could use a bit of gelatin or something to counteract that problem? Any of your thoughts or advice would be appreciated. You can try xylitol but yes, your caramel will be softer. I don’t recommend gelatin, though…it would give it a very funny texture. I live in Canada where Swerve is not available. Would it be possible to substitute Spelnda? Thanks! Swerve is most definitely available in Canada (I am from Canada originally). 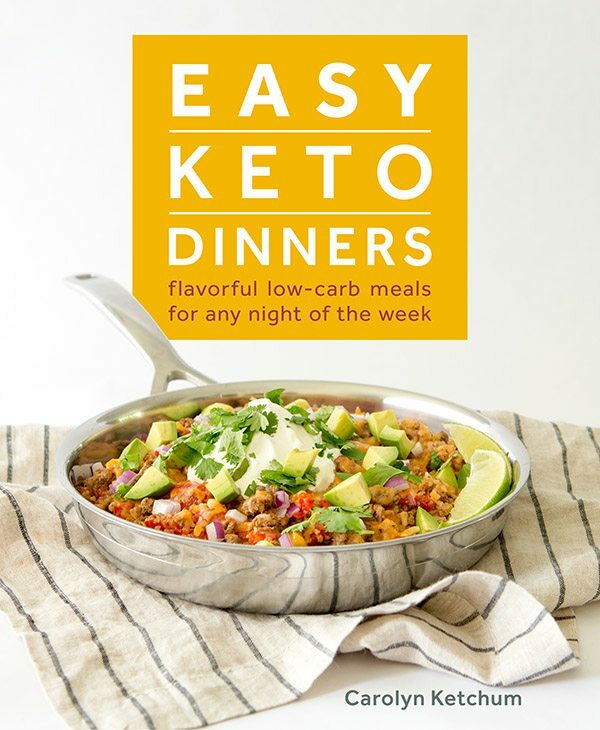 It’s in almost all Loblaws and Canadian Superstores and can be ordered from Low Carb Canada. Oh and no…this caramel sauce will not work with Splenda. But it does work with Swerve? I don’t have coconut sugar. Can I substitute more swerve for it and how much? I honestly don’t know if you can make this caramel dairy-free but coconut milk and oil might work. One of my favorite candies on Earth! I love this treat, it’s very nice when you want something that would be good for you on low carb, however just for anyone here, NEVER skip the whole “wait til it bubbles and cook for 3-5 minutes” for the caramel, I learned it the hard way that being to eager to take it off, made the cream not blend in but overpowered the whole thing and became white thin sauce, I ate it after freezing the bars but still, I did it again and did everything to the letter including bubble the caramel a bit then add the cream and it became a NICE gooey! caramel! Such a great idea! 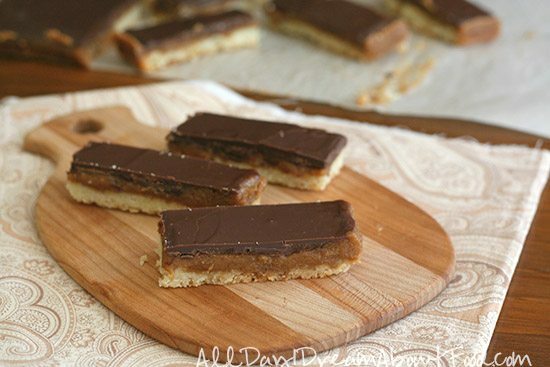 I have made a few different candy bars myself but need to try this one! I have made caramel and half of the time it works and half of the time it doesn’t The erythritol in Swerve re crystallizes after it cools a bit. Have you had this happen to you and do you have any tips on how to avoid it? Thank you! That’s always the tricky part but I have an update for my caramel sauce coming soon! Just wondering if you have an update for your caramel sauce? I don’t use coconut sugar and don’t keep molasses in the house either. I do have that new sugar sub that’s supposed to caramalize…wondering if you have tried a recipe with that? It’s called SOLA Low Calorie Sweetener. I don’t make a lot of sweets, so haven’t even tried it yet! However, I’m wanting to “perfect” a few keto candies to give to keto friends for the holidays and I think anything caramel would be a welcome treat. Please search my blog for caramel sauce. Is there a substitute for the coconut sugar? Yes, a teaspoon of the molasses or two teaspoons of Yacon syrup would be fine. When you say “Swerve,” do you mean granulated or powdered? If I don’t specify powdered, then I mean granular.